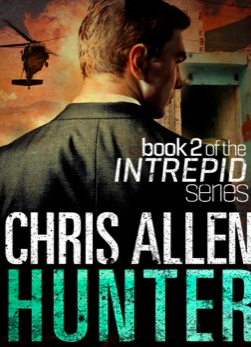 At the beginning of 2012 I was lucky enough to be introduced to Defender, the first in the Intrepid series by author, Chris Allen. I was immediately drawn into the world of Intrepid agent, Alex Morgan, hard-hitting and action packed, I enjoyed every page. You can read my original review here, but let me just say, I’ve been hanging out ever since for the release of the second instalment, Hunter: Intrepid 2. A lot has happened for Chris and his crew since his first release, not the least of which was the building of an exciting relationship between Chris and Pan Macmillan’s digital-only publishing arm, Momentum. A match made in heaven, this pairing has meant that Hunter has been brought to us with great gusto and in a fantastic digital format. It’s fantastically international, intricate in its detail and cast with a range of beautifully developed characters, all with their own missions and methods of achieving them. One of the things that strikes me the most about Chris’ work is that it is incredibly authentic, clearly very well researched, but at the same time avoids the trap of tedium that some highly detailed ‘action’ titles can fall into. At all times, the balance between fact and adventure is maintained superbly meaning that the story is punchy, compelling and always entertaining. I have to wait until next year for Intrepid 3! Chris Allen, author of the Intrepid series has been having a browse at the TBYL Store and put together a shopping list! 5 things I like from the TBYL Store, who I’d give them to and why! Curses and Blessings for All Occasions, by Bradley Trevor Greive… I admit to being very biased here because I know the author well and he is a great fella. However, despite my bias, this is an incredibly funny book. It is a must for anybody you know who deserves the escape and immense enjoyment of this page-by-page indulgence. This one is particularly suited to my wife Sarah who I’ve often found, on many occasions, giggling mischievously to herself as she discovers yet another favourite among BTG’s plethora of hilarious anecdotes. In addition, there’s an incredible history behind each and every illustration. Not to be missed. 2pm Haunted Small Pendant (1″)… There’s something very dark about this. I don’t know what it is that drew me to this piece but whatever it was it has succeeded in piquing my interest. There are a couple of people I have in mind for this. Suffice to say I think this gift would be more suited to a fan of, say, ‘A turn of the screw’ than the Twilight series. Happythoughts are Everywhere by Nicky Johnston… The thing that attracted me immediately to this book for kids was title followed immediately by the cover. We have a couple of great friends who are parents to three incredible little boys. I can say this now because Sarah and I have two little boys and boys are an absolute handful. When I saw this cover I immediately pictured the dad sneaking away for a quiet moment of solace under one of his boys’ beds having commandeered some toys. Although, in reality it is in fact the mum who would be in much greater need – and much more deserving – of the escape! Diary of a Penguin-Napper by Sally Harris… I absolutely love the premise of this book especially the fact that the young hero would do anything to impress the girl of his dreams. I want this book for my two boys! Enough said! 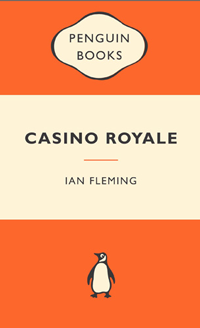 Casino Royale by Ian Fleming… It is absolutely no secret that I am a huge fan of Ian Fleming. With the recent release of Skyfall there’s been more than enough discussion of James Bond of late. However, I am duty bound to explain my reason for jumping on the bandwagon. It’s a sad fact that only truly die-hard Fleming fans or those who have read at least one if not some of his books can genuinely attest to his incredible mastery of story telling within the modern thriller context. I would offer this book as a gift to any reader of action thrillers whose only experience of 007 is via the movies. Casino Royale is a timeless classic of the genre, evidenced by the superb cinematic realisation in 2006 of the story first published in 1953. My love of reading was ignited by Fleming’s writing and he left such an impression on me that I can also unequivocally trace my determination to become a successful published author back to his books. Feel free to have a browse around the TBYL Store yourself… you can shop here! You can pick up a copy of Hunter: Intrepid 2 at the Intrepid website, and if you’d like to check out some other exciting Momentum titles, take a look at their website here. Prev Just a few friends away from a massive book give-away	Next Give-away: Send us a Christmas Card!